Formerly a staunch atheist for 35 years, homicide detective J. Warner (Jim) Wallace applied forensic analysis to the Gospels and became convinced that they are, in fact, reliable eyewitness statements. 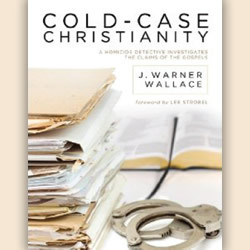 In his new book, Cold-Case Christianity (David C. Cook), Wallace posits that Christianity can be defined as a “cold case,” as it makes a claim about an event from the distant past for which there is little forensic evidence. Using investigative techniques and including gripping stories from his career, Wallace examines the powerful evidence that validates Christianity’s claims. In this fascinating book, readers will learn 10 principles of cold-case homicide investigations, criteria for evaluating the reliability of witnesses and techniques to employ in response to skeptics.